"Hey Sivvers! Did you see this?" Andy asked. "Did you see what is written on the back cover of this book?" Sauntering over to the desk where his brothers were working, Seville examined the back cover of Escape Claws by Linda Reilly, the book the three boys were currently studying for Kitty Lit. 101. "Did I see what?" he asked. "On the back cover of the book, Escape Claws, it says, you can inhale too much catnip." "Let me see that!" and Seville grabbed the book out of Andy's paw. A moment later he looked up and replied, "That there is some kinda rhetorical question, I do believe. Everyone knows it's impossible to inhale too much of the nip. MOUSES!" "See? Told you," said Rushy, nudging Andy in the side. "A cat can have too little catnip, but never too much. Of course..." Rushton rested his chin on a paw. "Lara isn't a cat, is she? She's just a peep. It's quite possible that peeps can have too much nip." "QUIT TALKIN' NONSENSE!" Seville demanded. "I will not have my brothers talkin' like this. There is never too much nip for anyone. NEVER." He looked from Rushton to Anderson, and then back to Rushy again. "You two finished your book reports already?" Anderson hesitated before answering. "Not exactly." "We got talking about the book's back cover," admitted Rushy, "and..."
"And that's sort of where we're still at." Andy added. "You know," began Rushton, "it seems to me, reading the book is a whole lot more fun than writing about it afterwards. I'd much rather read Escape Claws a second time than write about it. I'd much rather read it a third time, too!" "Wouldn't we all?" asked Seville. "But that's not how school works, guys." "Yeah but still... I mean, Escape Claws was THAT good. Good enough to read more than once." "Oh for the love of mouses," and Seville rolled his eyes. "You have to write the book report so that Professor Lyon knows you've read it, and understood it, and..."
"And enjoyed it?" asked Andy. "Because I did." Seville sat back on his haunches. A broad smile grew across his face. "I did, too. I always wonder how much I'll like the first book of a new series, you know? 'Cause in the first book, you haven't yet met the characters and stuff. And you don't know if you'll like 'em or not." "I liked Aunt Fran," blurted out Rushy. "She has a boatload of cats, and..."
Andy tugged on Rushy's tail. "She has a house load of cats, Rushy. Aunt Fran doesn't live on a boat." Seville sighed, loudly. "It's just an expression of speech, bro. MOUSES! What Rushy is sayin' is, Aunt Fran has a lot of cats." "Oh." Andy looked down at the floor. Looking up, he quickly added, "Do you know who my favourite cat is?" he asked. "Would that be moi?" Seville asked. "I meant in the book, Sivvers. Do you know which cat of Aunt Fran's is my very favourite? Don't bother guessing," and Andy held up a paw. "My favourite cat of Aunt Fran's, is Blue." "But Blue isn't Aunt Fran's cat," Rushton stated. "Blue belongs to..."
"Blue belongs to no one, I should think," interjected Seville. "Blue is her own cat. A cat who goes about doin' what she wants. Goin' WHERE she wants. Makin' pals with whomever she wants. Plus, she's a ghost. Blue is a ghost cat. She was Lara's pet when Lara was a young girl. Kinda. Sorta." "What do you mean by that?" asked Rushy. "How was Blue just kinda or sorta Lara's pet?" "Well... You know. You read the book, too," stated Seville. "Blue is a mystery within a mystery. Kinda neat, if you ask me." Andy nodded vigorously. "Blue and Lara are reunited when Lara returns home to Whisker Jog to help Aunt Fran with all the other cats. You remember that, don't you Rushy?" "What I remember is that Aunt Fran was in need of Lara's help. There were the cats, and her poor health, and that nasty town bully." "Oh, he was a real piece of work. Tryin' to force Aunt Fran to..." Seville paused. "Let's just say, he was not the nicest of peeps." Seville's brothers nodded in agreement. "I'm super glad Lara was able to return home and help out," began Andy. "But then..."
"Then she found the body," Rushton finished. "Actually, that's not true," Seville corrected Rushy. "Oh sure, the police and everyone thought Lara found the murder victim, but really, it was Blue. Blue led her right to it!" "And landed Aunt Fran on the suspect list," added Rushton. "Yup, right there at the top, too," Seville nodded. "Of course, that's what happens in real life, isn't it? The police always look at the person who calls in the uh.. murder. MOUSES!" "And of course, by then, we were all rooting for Aunt Fran 'cause she's such a nice lady." Rushton thought for a moment. "I think that's a real credit to Linda Reilly's writing. Don't you agree, Seville?" "I sure do," Seville answered. "Linda creates characters with real substance. They have layers, you know? They're multi-dimensional. They have depth. Makes the reader invested in what happens to 'em, I think. Makes us root for Aunt Fran and Lara. Makes us want justice to be found, too." "Seville," began Andy, "were you worried the police might not be able to figure out who the real killer was?" "I was, kinda. It was a hard mystery to solve." "Good thing Blue was able to help Lara solve it," added Rushton. "Yeah. I tried," Seville began, "but no matter how hard I worked at it, I couldn't figure out who the killer was. I always do, you know. Try, I mean. When readin' a murder mystery, I always try to solve the mystery myself. I think every avid mystery reader does. I..."
"YOU HAVE RABIES?" gasped Anderson. "What? What the mouses are you talkin' about, Andy? I said I was an AVID mystery reader, not a RABID mystery reader. MOUSES!" "Whew!" Andy breathed a sigh of relief. "ANYWAY," continued Seville, "I was tryin' to figure out who the killer was right to the very end of the book, but for the life of me, I couldn't! Now that there is the mark of a good book. Yes sirree, surprising twists and keepin' the reader in suspense right to the end is what makes a mystery great in my books, for sure." "Great in your books..." Andy scoffed. "In your BOOKS. And it IS a book, and..."
"Of for the love of mouses," Seville sighed. "Sometimes I really wonder 'bout you two. Are you sure we're actually related?" Andy thought for a moment. "I don't really know, Sivvers. Peep #1 says we are." He clicked his claws together. "But Lara is good at figuring out mysteries. We should ask her." Seville slouched his shoulders. "For the love of mouses," he muttered. "Um, Seville? I have a question. There was one thing about the book I didn't like. Should I write about that in my report?" Rushton asked. Seville's jaw dropped. "Really, Rushy? There was something 'bout Escape Claws that you didn't enjoy?" "Well yeah," nodded Rushton. "It came to an end. I was enjoying it so much, I wanted to read more." "Well then you're in luck!" exclaimed Seville. "Because Escape Claws is only the first book in a whole series! Book number two of the Cat Lady Mystery series, Claws of Death, will be out on June 26th, and we can all read that one, too." Seville smiled, "Isn't that wonderful news?" "It sure is!" Rushy and Anderson cried in unison. Seville looked sternly at his brothers. "But for now, you had both best be gettin' on with those reports of yours for Professor Lyon, okay? Okay. MOUSES!" Escape Claws is the first book in the Cat Lady Mystery Series written by my pal, Linda Reilly. It's published by Lyrical Press, a division of the Kensington Publishing Corporation. You can connect on-line with Linda through her website, Linda Reilly, or on her Facebook page, Author Linda Reilly or on Twitter at LindaSReilly7 The cover picture of Linda's book was used with Linda's permission, of course. Purrs. Disclaimer: We received no monetary compensation for this post, and all opinions are my own. MOUSES! Escape Claws sounds like a book my mom would love to read. *takes out purrrple crayon and writes down Linda Reilly name* I'm gonna buy this for Mom for Mother's Day. Purrrs! WOW! That sounds really, really interesting. Thanks for telling us! You three cats are the smartest in town! No...in the whole universe! So glad you liked ESCAPE CLAWS, 'cuz there's more Cat Lady mysteries coming this year! That sounds like a good book. I'm pretty sure that there is no such thing as too much nip for anyone. My cat Jake said he would be glad to volunteer to test that theory. I'm pretty sure 'bout no such thing as too much nip, too. Now to convince the peeps. MOUSES! oohhhh this sounds very intriguing. OMC, that was a really fun review, you guys! I was going to say, killer book review, but shall forgo that pun. Mol. I shall add this to my book purchase list, for mother’s day... so all I need now is a mother to buy it for me! Book reports aren't so bad, kitties...especially when the book is a great story! Me too. Wouldn't that be awful? I'm wonderin' if my brother has wax in his ears. MOUSES! Pick a story and stick to it, Handsome Marmi-ness! That sounds like a great book. You all did a wonderful review of it. Oh my Escape Claws! Great title and love the cover art work to match! Sounds intriguing. Will share! Totally brilliant review you guys. Absolutely fantastic. ANOTHER amazing book we want to get. We love cosy mysteries and ones about cats are top of our list to bring home from the USA in April!!!! I am always unhappy when a great book ends too! 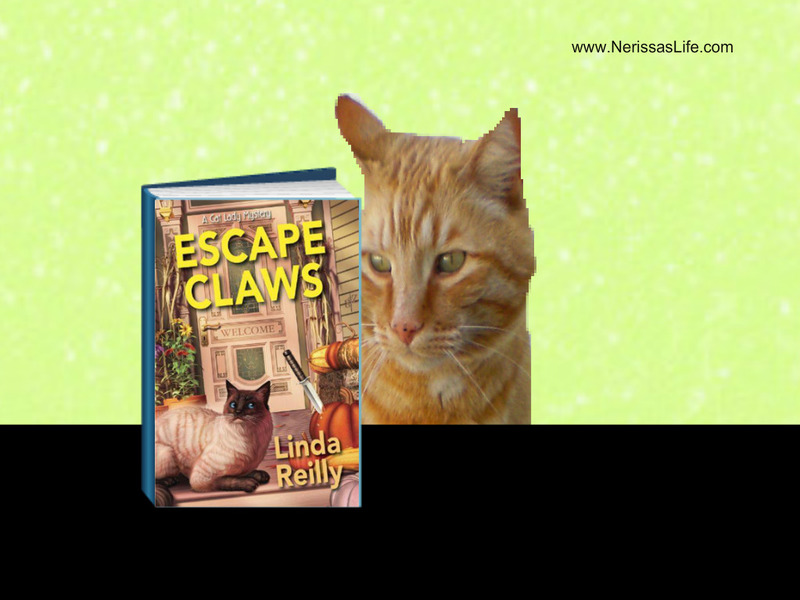 Escape Claws sounds like one of those types of reads! You guys sure know how to write a GREAT book review! Lexy is on Amazon RIGHT NOW downloading it Mommy's kindle. Cat mystery books are always so much fun. We all know that the cat characters are the real stars of the story! This book sounds like a fun one. We'll have to check it out. Thanks for the great review! What a fun review of this book! This is one I'd like to add to my reading list for when I decide to read again! Thanks for the laugh! They make an avid little book club! A pluses for everyone's reports. An avid or a rabid book club? Just checkin'. PURRS. Lol. You three make me chuckle. I'm now very curious about the book! Oh, and Goose would agree, you can't have too much catnip. Nope, there is NO SUCH THING as too much nip. I don't know WHAT my brothers were thinkin'. MOUSES! 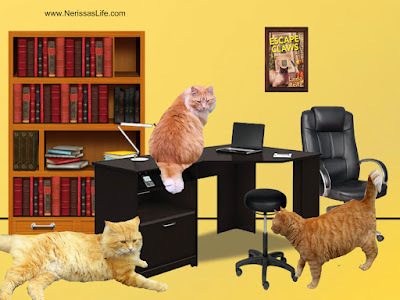 Fascinating...love the book cover and the dialogue among the kitties...such humor. Oh we talk with one another all the time. Drives Peep #1 crazy, she says, BUT THE TRUTH IS, she was way past crazy before we ever came along. MOUSES! Thanks for sharing that Severs, Andy and Rushy! 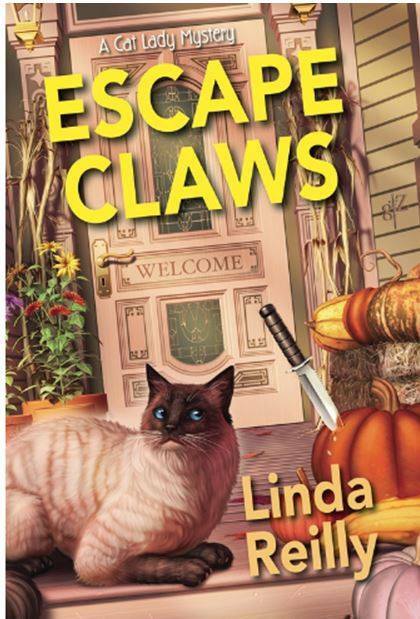 I"m in the middle of reading a different book right now, but 'The Escape Claws' will go on my list! I think all mysteries are truly solved by cats. Tee hee hee! Head nuzzles. That's 'cause we cats are the brains of our families. Don't you agree? I have no idea what my peeps would do without me. PURRS. This may be the best book review I've ever read! It sounds like it is awesome story.